Anti-UV filters are used to prevent ultraviolet light from getting through the lens, by reducing haziness or fogginess caused by that type of light. 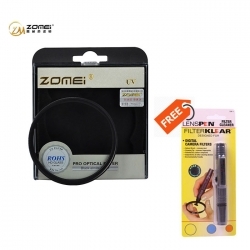 Anti-UV filters offer a physical protection from dust or scratches to the lens. Only 2.82mm thickness, Wide-angle lens compatible ultra thin frame. Transmittance up to 99.7%. Made with no compromise. Glass mounted with high pressure press technology. All Materials Used in this filter Meet the Requirements of European Union's standards of Environ Ment Protection-ROHS(Restrictions on Hazardous Substances).